This is a 5.25″ wide mint patch which features the logo of the Umbrella Corporation as seen in the movies and on the hot cult video game Resident Evil. 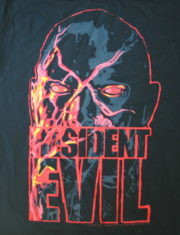 This is a 100% cotton, pre-shrunk, silk screen design featuring a zombie face with red eys and the Resident Evil name over the bottom. Produced for the last movie, this is a limited production shirt that had a one-time print run. 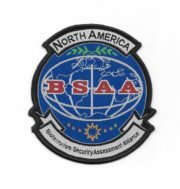 This is a 3.75″ high mint weave design patch which features the logo of the North America BSAA (Bioterrorism Security Assessment Alliance) as seen in the movies and on the hot cult video game Resident Evil. This is a 4″ wide x 4.5″ high mint embroidered patch which features the logo of the Raccoon City Security Service from the new hot cult video game Resident Evil Operation Racoon City. 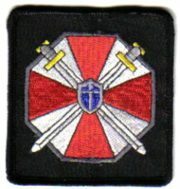 This is a 3 1/4″ high mint patch which features the shield logo of the S.T.A.R.S. 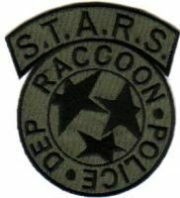 Raccoon Police Department (A branch of Raccoon’s Police Department named Special Tactics and Rescue Squad) as seen in the movies and on the hot cult video game Resident Evil. This is the blue silver star version. 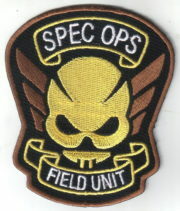 This is a 3″ wide x 3 1/2″ high mint embroidered patch which features the logo of the Raccoon City Special Operation Field Unit Team as seen in the movies and on the hot cult video game Resident Evil. This is a 3 1/2″ wide mint patch which features the logo of the S.T.A.R.S. 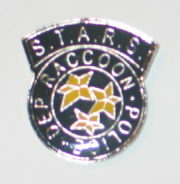 Raccoon Police Department (A branch of Raccoon’s Police Department named Special Tactics and Rescue Squad) as seen in the movies and on the hot cult video game Resident Evil. This is the olive version. This is a 3.5″ wide mint black patch which features the logo of the S.T.A.R.S. 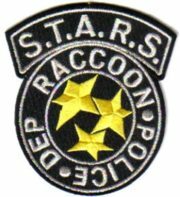 Raccoon Police Department (A branch of Raccoon’s Police Department named Special Tactics and Rescue Squad) as seen in the movies and on the hot cult video game Resident Evil. This mint enamel metal pin pictures the logo of the S.T.A.R.S. 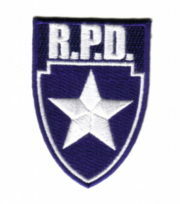 Raccoon Police Department as seen in the Resident Evil movies and the video games and as worn on the uniforms of the police. 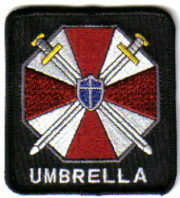 This is a 3″ wide mint patch which features the umbrella logo of the Umbrella Corporation as seen in the movies and on the hot cult video game Resident Evil. This is the smaller version that is worn on the shoulder. The sought after antidote made by the Umbrella Corporation is now available as an energy drink. This is an unopened set of six 8.4 ounce (250 ml) cans illustrated with the Umbrella Corporation and Resident Evil logos. The sought after antidote made by the Umbrella Corporation is now available as an energy drink. This is an unopened case of 24, 8.4 ounce (250 ml) cans illustrated with the Umbrella Corporation and Resident Evil logos. The sought after antidote made by the Umbrella Corporation is now available as an energy drink. This is an unopened 8.4 ounce (250 ml) can illustrated with the Umbrella Corporation and Resident Evil logos. 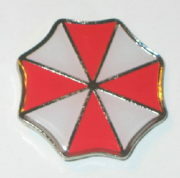 This mint unused metal enamel pin pictures the logo of the Umbrella Corporation as seen in the Resident Evil movies and the video games. It measures 2″ wide and is stored in a smoke and pet free environment. This is a 4 1/4″ wide mint patch which features the chest logo of the Umbrella Corporation as seen in the movies and on the hot cult video game Resident Evil. 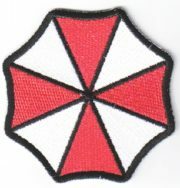 This is a 4.5″ x 1.5 mint patch which features the chest logo of the Umbrella Corporation as seen in the movies and on the hot cult video game Resident Evil. This version features the motto “Our Business is Life Itself” at the bottom. 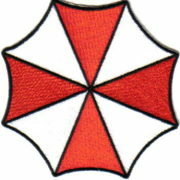 This is a 3″ wide mint patch which features the logo of the Umbrella Corporation as seen in the movies and on the hot cult video game Resident Evil. 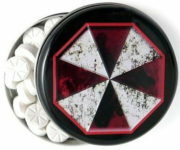 This is a 5.5″ high mint patch which features the logo of the Umbrella Corporation as seen in the movies and on the hot cult video game Resident Evil. This is the larger version that is worn on the back of a jacket. 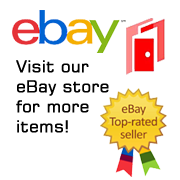 This is a 3.75″ wide mint patch which features the umbrella logo of the Umbrella Corporation as seen in the movies and on the hot cult video game Resident Evil. This is the large version of the one that is worn on the shoulder. 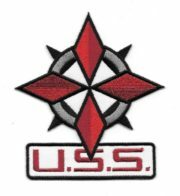 This mint unused metal enamel pin pictures the logo of the Umbrella Corporation Special Forces Unit as seen in the Resident Evil movies and the video games. It measures 1.5″ x 1.5″ and is stored in a smoke and pet free environment. 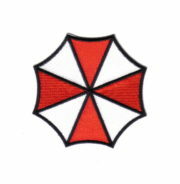 This is a 3″ wide mint embroidered patch which features the sword logo of the Umbrella Corporation as seen in the movies and on the hot cult video game Resident Evil. This is the version worn on the shoulders of their employees. 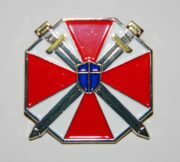 This mint enamel metal pin pictures the logo of the Umbrella Corporation as seen in the Resident Evil movies and the video games and as worn on the shoulders of the Umbrella employees and on the walls and other property. It measures 1.25″ wide. This is a sealed box of 18 tin cans filled with breath mints that have the familiar Umbrella logo on both the mints and the cans from Resident Evil, from the hit movie and video games. This is a sealed tin can filled with breath mints that have the familiar Umbrella logo on both the mints and the can from Resident Evil, from the hit movie and video games.